Chicago, Illinois. 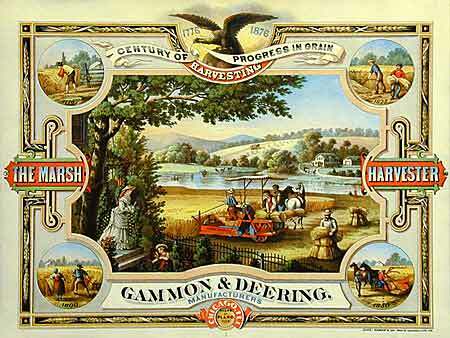 McCormick-International Harvester poster printed by Charles Shober & Co. for Gammon & Deering. Inset views of obsolete harvesting technologies helped portray the Marsh Harvester as the pinnacle of mechanical genius. "Art of the Draw: Advertising Posters from the McCormick-International Harvester Collection" features 50 advertising posters selected from the collection. The International Harvester Company was the largest and most influential farm equipment manufacturer of the 20th century. Explore poster printing technology, lithography and graphic styles over the years. See how farm machinery changed over time and across the globe. Examine advertising methods and icons of the early 19th century.